Photo 29. 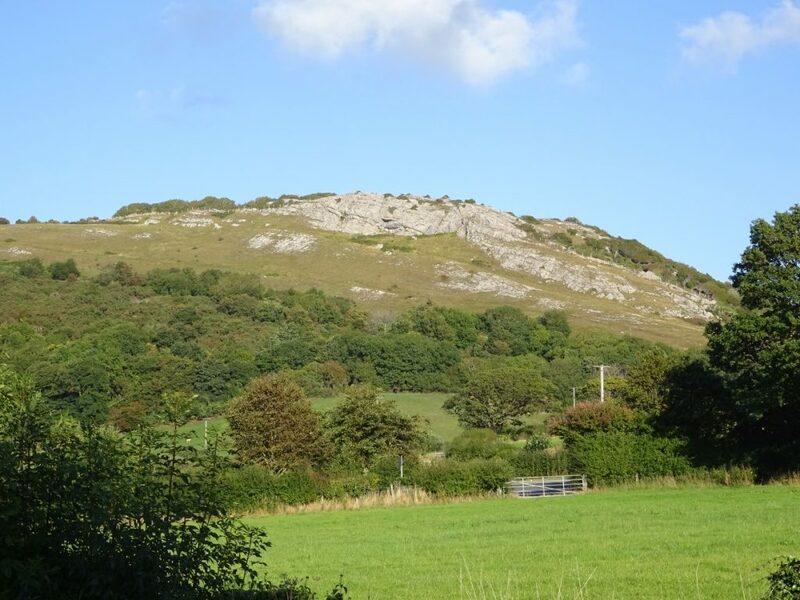 Just to the south-east of Llandudno, and adjacent to the Little Orme, as seen in Photo 28 above, the limestone hills of Mynydd Pant, Nant y gamar and Bryn Pydew are also probably back-reef platform carbonates, although the northern face of Nant y Gamar may also be a marginal reef build-up. In this panorama looking south-east along the North Wales coast the platform carbonates of Mynydd Pant clearly dip south-east, towards Penrhyn Bay village. This dip, of about 10-30 degrees also reflects later, end Carboniferous, tectonic folding, caused by the Hercynian Orogeny. The limestones in the hills of Bryn Pydew, just across the valley, dip towards the viewer, towards the north-west, indicating the intervening valley is the core of a fold, the Gloddaeth Syncline. Photo 30. Just to the west of Mynydd Pant, the steep cliffs of the south-western end of Nant y Gamar hill clearly dip away to the south-east, down into the core of the Gloddaeth Syncline. Photo 31. In the bottom of the valley, seen in Photo 29 above, there are small, poorly exposed outcrops of reddish purple to greenish, coarse grained sands and muds. 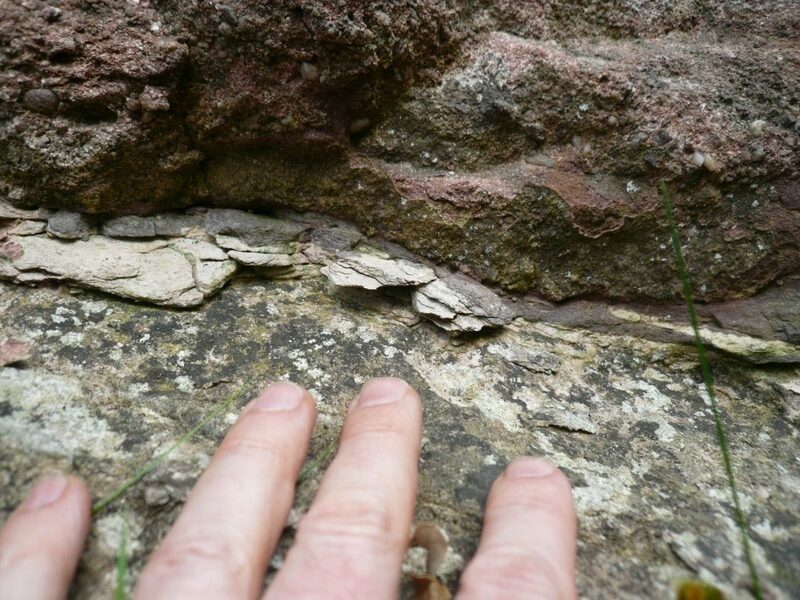 These rocks are the younger units of the Gloddaeth Purple Sandstone, preserved in the core of the Gloddaeth Syncline. They clearly reflect the input of coarse, probably fluvial channel clastic sediments, above the limestones, suggesting either a sea level fall, sediment progradation into the basin, tectonic uplift, or possibly a combination.